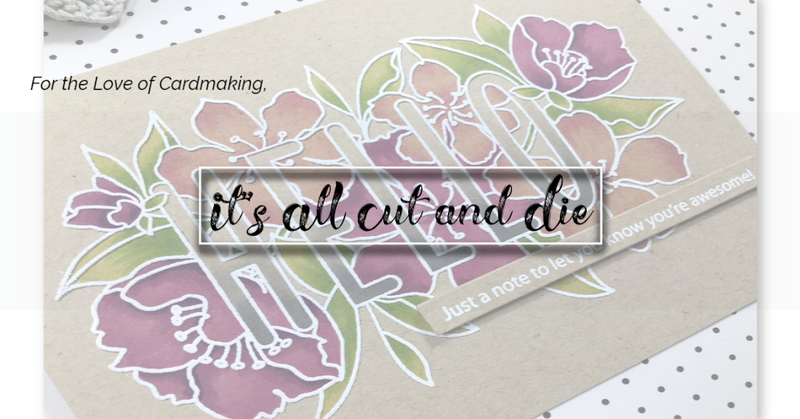 It's All Cut and Die: My Creative Time 84th Edition Release Blog Hop and Sale!! My Creative Time 84th Edition Release Blog Hop and Sale!! Welcome to the Blog Hop!! You should have arrived from the lovely Miss Kendra but if not you can find the full hop here!! We are celebrating with some giveaways and a sale so stay tuned to the end of this post for all the details!! My project today combines the Santa Hat Lollipop Holder Die AND the Reindeer Lollipop Holder Die. Yes, these can be used together!!!! As soon as I seen these dies, I knew I just had to combine them somehow! 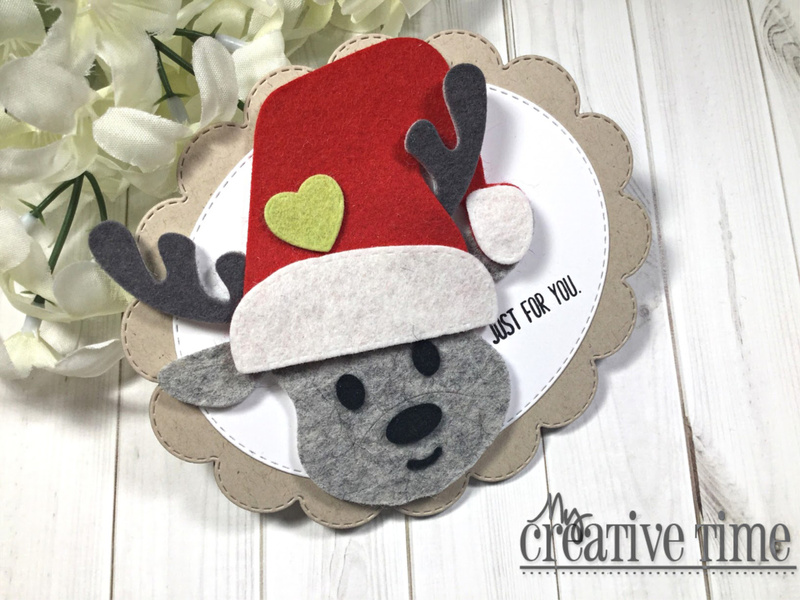 I used the Reindeer a lot like I did on yesterday's project except I used felt. I'm pretty sure there aren't any grey reindeer but I didn't have any brown felt so I went with it!! To make the images more sturdy, I actually die cut the pieces out of craft foam and adhered the felt onto it. This also gives some awesome dimension! I used Glossy Accents to glue all the felt pieces down and it works great! I made a shaped card using the largest die from the Scalloped Stitched Oval Dies. The scale of the dies are pretty close so they work well together. To break up a bit of the red hat, I added a cute green heart. 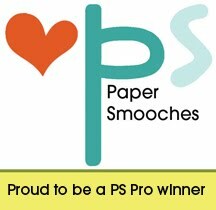 I hope I've given you a few ideas this week on how to use the products from this awesome release!! Up next on the hop is the talented Miss Ruthie!! For our blog hop giveaway, Emma is giving away a $25 gift card to the "My Creative Time" store to ONE LUCKY winner! 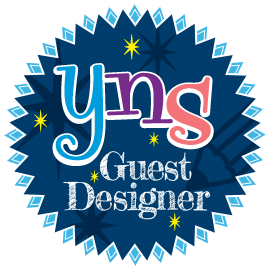 ALL you have to do is leave a comment on each of our blogs! You are NOT required to comment on EVERY SINGLE blog, but the more you comment on, the MORE chances you have for winning! VERY IMPORTANT, PLEASE leave a way for us to contact you w/your comment just in case "YOU" are the lucky winner! 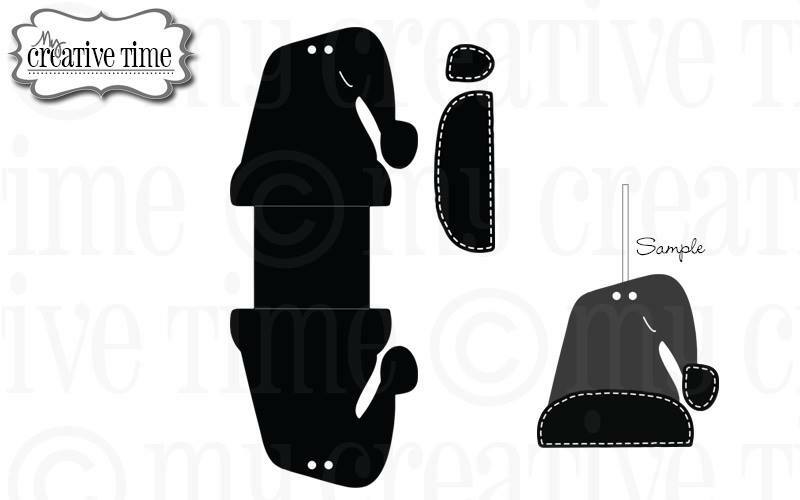 ALSO, DON'T FORGET our sale starts RIGHT NOW here:http://shop.my-creative-time.com/Ne...! Use the code: OCT2018 to receive a 15% discount off your entire purchase! This sale applies to "IN-STOCK" items ONLY. This sale will end on Friday, October 26, 2018 @midnight PST. OMG Miss Laurie Are you kidding me OMG Your Card is Outstanding, Incredible and Spectacular!! I'm in awe of what you came up with using the two Lollipop Holder dies. Your Rudolphia is as precious as can be and love that you used felt..and your Santa Hat is so cute!! You totally did a Super Creative job!! YOU so ROCK!! Such a great idea using felt...so cute! How fun--love that you used felt. LOL This is so darling and I love it. Love the felt. 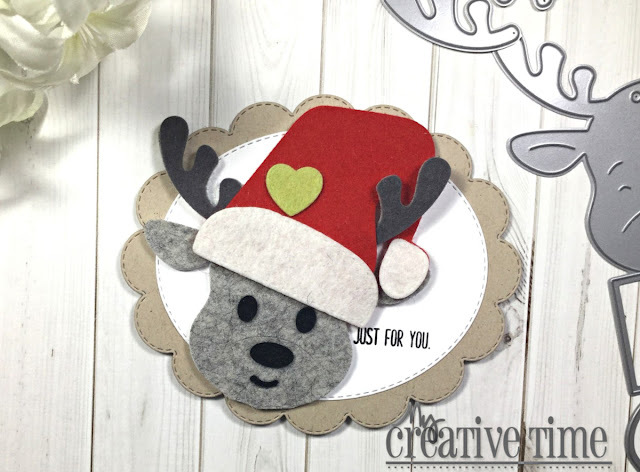 The adorable deer looks great in felt...what a fun idea! Great job. Oh works with felt. Nice to know. Clean cuts. This is just so darn cute! I love how you combined the two sets!!! Love that you combined these dies together! Adorable result! Grey works great. Love it out of the felt so cute! I really love this!! So neat to use the felt and the grey looks so neat!!! Too cute!! 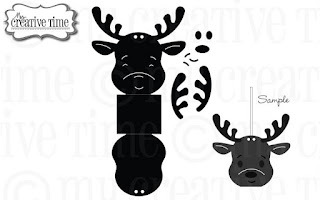 The grey reindeer is super adorable! Love the use of felt for this cute project! A wonderful release! Thank you so much for taking the time to leave me a comment! Whatever Wednesday with My Creative Time!! 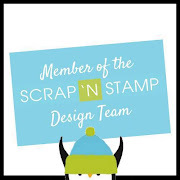 Scrap 'N Stamp Spooktacular Blog Hop!!! 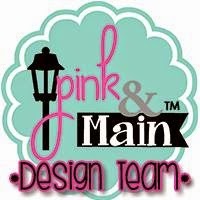 Pink & Main and WOW Embossing Powders Blog Hop!!! My Creative Time 84th Edition Sneak Peek #3!! 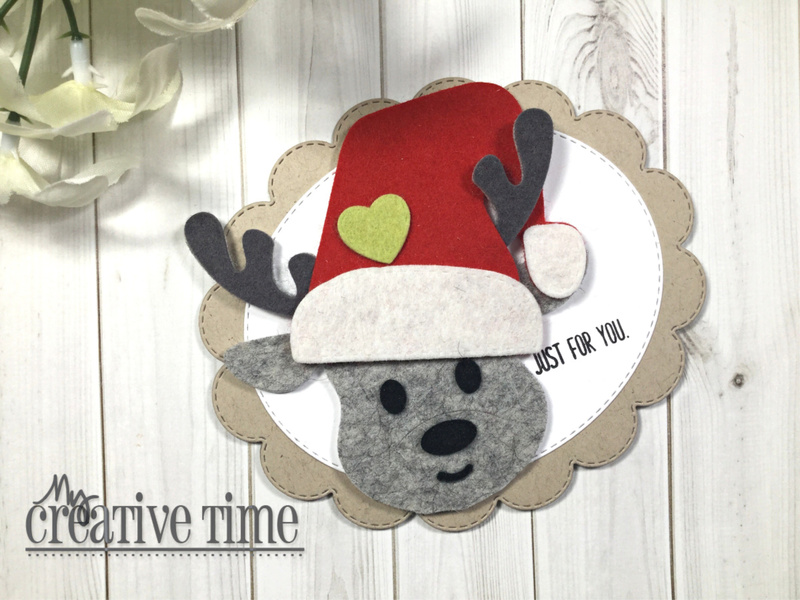 My Creative Time 84th Edition Release Sneak #1! Made in Minutes with My Creative Time! My Creative Time 48 Hour Flash Sale!! 3-D Wednesday with My Creative Time! !